Tried this stuff to see if I could hunt with my SKS. Not going to try since I've found out my barrel is worn and nothing groups when the barrel is cold. Once warmed up it shot really well and had more kick. I run PPU thru all my guns, never never had a problem EVER. 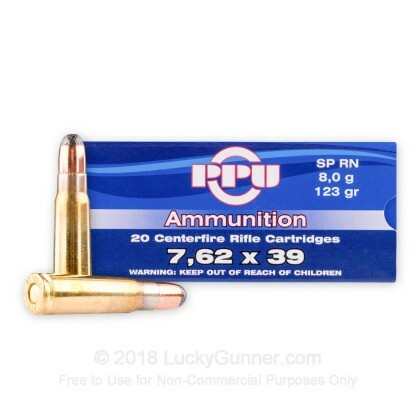 I m running this ammo in my SKS's 45, 56, 59/66's, CZ, Ruger 77, REM 798, and RPK. The level of accuracy is nearly unbelievable from every one of my weapons. The SKS's are all equipped with TechSight TS200's. On most days my SKS's will group the first three rounds into the same hole at 100 yards. Only one of the Vermont White tailed deer I have harvested with this ammo went farther than straight down, and that buck when hit fell down the backside of the steep bank 15ft. Every White tail has been a one shot DRT harvest. I would like to try this ammo on one of our Vermont Moose next. I am certain this ammo can quickly and cleanly harvest a Moose. I have a really nice SKS that will shoot anything and will hit water jugs consistently at 100 yards. 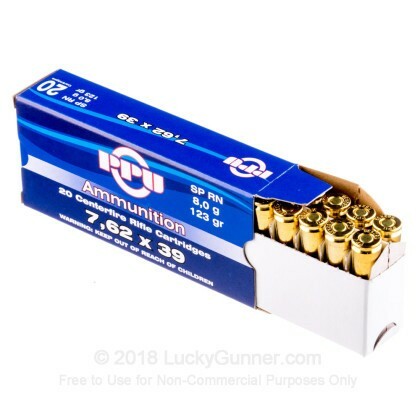 I just purchased a Savage 10FCM in 7.62x39 and wanted some better and more accurate ammo then the steel cased stuff. So far I have only sighted my rifle in at 50 yards, but once I got it dialed in these babies were hitting inside a quarter. I still need to sight it in a 100yds, but I am waiting on the weather. I switched back to barnaul sp after I shot all the PP ammo I had and it was no where near as accurate. Anyways I purchased 200 more rounds for my rifle and am just waiting to get back to the range, and then for deer season. I definitely recommend these rounds! These are great rounds, I've found them to be accurate and consistent. They also seem to be a little hotter than the steel stuff (they have a higher POI and more pronounced bang). I have found them to feed just fine in my SAR-1(AK) and Russian SKS's. I took a big doe this year with this round too, she didn't make it 25 yards before she was DRT. Overall I was really impressed with this round, I used to use S&B SP's but these are just as accurate while being hotter and steel-less. Will be my "goto" hunting round from now on. Not the best for ak platform. The exposed soft point can cause failure to feed issues with the ak 47 platform. There is no feed ramp in the ak design and the barrel usually has a sharp edge on the breech face. This sharp edge will mar and catch the soft point of this bullet in some ak s. This was creating lead shavings which ended up jamming the magazine. I have three Romanian ak variants and this ammo functioned flawlessly out of one but the other two it would jam every other round. So it may function fine in you ak. The ak platform was designed to operate with full metal jacketed bullets. I did modify the breech face on one of my ak variants to improve the feeding issue with this ammo now it functions flawlessly. But it still mars the soft lead tip of these bullets. Just not as badly. The modification was rounding the sharp edge on the breech face of the barrel with 3000 grit wet dry sand paper. 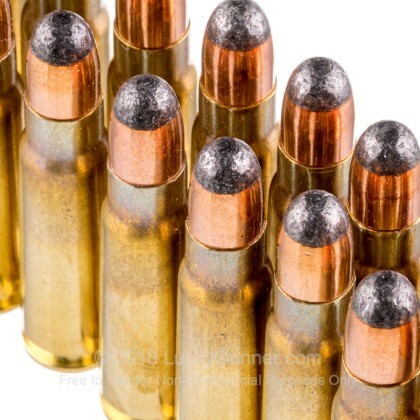 My guns have had thousands of rounds threw them with various brands of full mettle jacketed ammo. 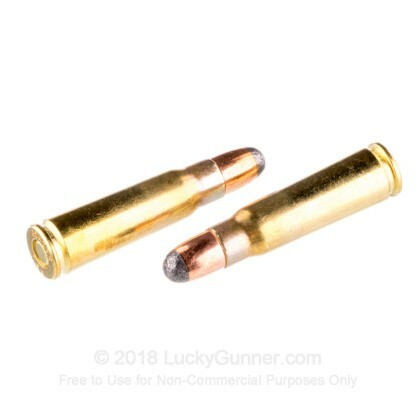 Until this ammo I never had a failure to feed issue. 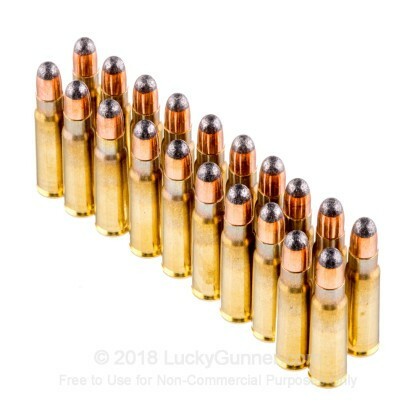 Purchased 80 rounds of this ammo for deer season. Shooting from my Ruger mini 30, it took three groups of five to dial it in at 100 yards. Buck went down on first shot---made a believer out of me. Q: bi-metal or copper jacket? A: Hello Daniel, This Prvi Partizan ammunition is loaded with a standard lead core, copper jacketed projectile. 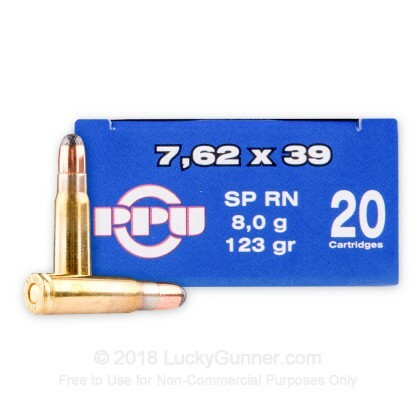 We also have this 7.62x39 - 123 gr SP - Prvi Partizan - 1000 Rounds ammo in stock in a bigger quantity.